I wasn’t even looking for warblers this season, but I saw a Chestnut-Sided Warbler in a cedar at the shore when I was on retreat. A jewel of a bird; about as exotic looking as little songbirds come around here. I was just standing on a deck, deep in thought, and there it was, in a branch about six feet from me. I also saw another warbler, something yellow, dark, and striped, but I didn’t get a close enough look at it to identify it. Magnolia, or Cape May, perhaps. I wasn’t out this season to look for warblers, and now the migration has largely passed me by. Spring is becoming summer, and I feel once again like I haven’t fulfilled my obligations. 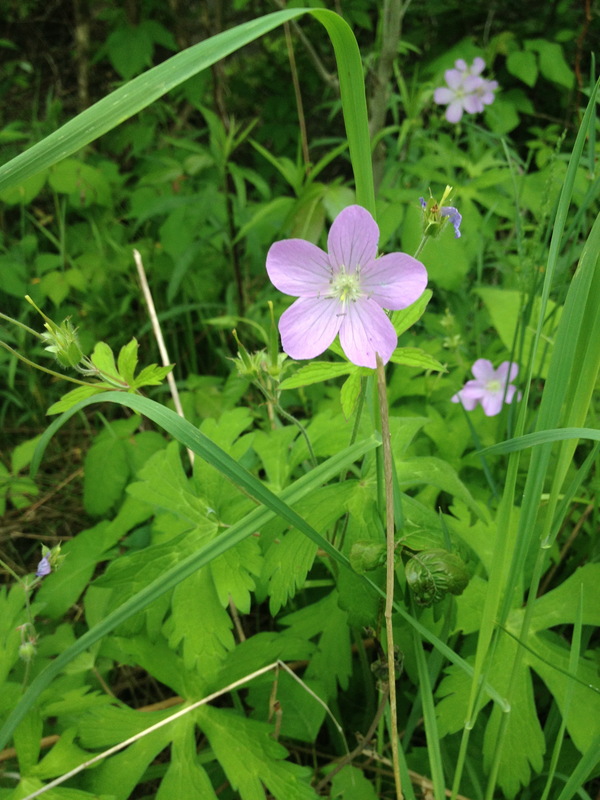 Spring is a time of responsibility for me: the frogs crawl out of the muck and start chiming, insects and wildflowers appear, and birds begin moving up the coast. As soon as I notice things changing, I start telling myself that I need to get out the frog call and insect noise CDs to start learning to identify the sounds by ear. Get out in the woods and field with the binoculars and a notebook.This year, of course, I keep meaning to get back with learning the butterflies, and so I need a good field guide. And a good net: I’ve learned I don’t always have the patience or stamina to stalk a butterfly long enough for me to see it as it lands on a nearby branch. As I was out walking earlier today, the dogs ran by me in a spurt of enthusiasm – they are whippets, and run a lot, very fast, with much enthusiasm – and startled an orangey skipper before I could get close enough to note and commit its features to memory to look up later. Because I have the dogs, and because another form of responsibility insists that when I’m out walking I should make every effort to bring them along so they can get some exercise and some enjoyment, I’m not often walking with binoculars looking carefully for the warblers, and others, passing through. The dogs make a bit too much ruckus for real birdwatching. And the boy often comes with me, too, when he’s not in school, and he talks non-stop. So as I walk through the woods, I’m surrounded by a loose bubble of noise and commotion, which makes stopping for birds and bugs a little harder. It certainly doesn’t draw them too me any better. But I’ve never really considered myself a birder, despite my deep and abiding fondness for birds, songbirds especially. I find the list approach off-putting, for one thing. And I know that committed birders have all kinds and varieties of lists, and they’re not giving each species a more-or-less fungible weight that once checked off absolves the birder from giving that species any further regard. I know this, but still the field-guide approach, the effort to see everything within a national range, and the completist impulse all unnerve me slightly. My focus has always been a bit more local: I love the birds because they are an expression of the place where I am. And quite literally an expression: the birds are the place made audible, its own speech of a sort. And the same with the flowers, the trees, and the frogs and others. The responsibility I feel is the obligation to know what’s right here with me and how it fits. And that of course is leaning rather hard on a necessary personal observation that I’ll just leave hanging for a bit. I have some nicer thoughts about lists and birds plus insects that I hope to write about soon. I haven’t been doing much writing. I need to work harder to organize my working life so that I am doing the writing – another obligation I’m not living up to. 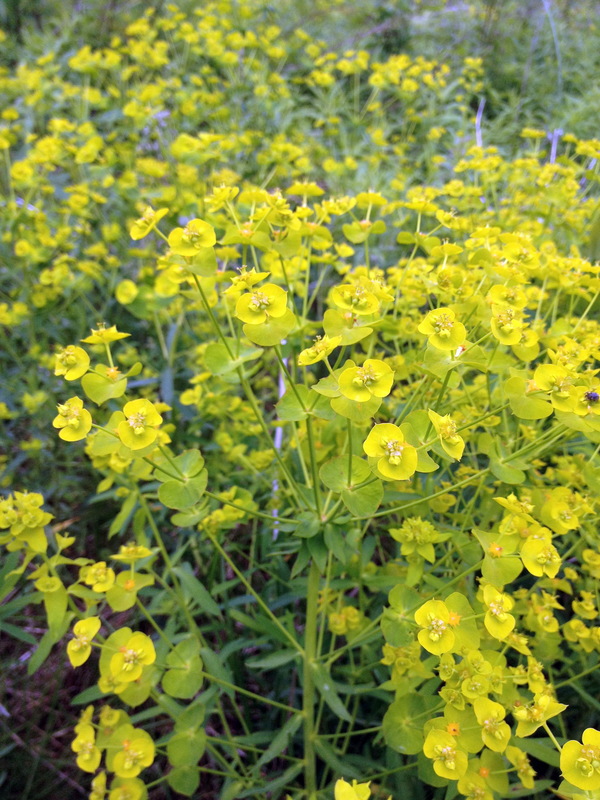 And leafy spurge. It’s an invasive, but I can’t deny its beauty.